The ITT580 was a badged version of the Philips V2022 unit. This was the second of the Philips V2000 VCR's to be sold in the UK. Like it's predecessor, the V2020, it had the destinctive look which was to become the hall-mark of V2000 VCR's. All machines were top loaders but with a difference. The cassette housing was hinged from the rear so that in the open position it would glide up and open rather than pop up like the mechanisms used in some other formats. 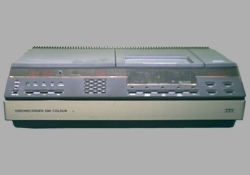 Like all V2000 VCR's this model used Dynamic Track following which meant that there was no external tracking control. The tracking was performed electronically and the video heads followed the correct path guided by the action of the piezo-electric crystals they were mounted on. The ITT580 video featured Philips unique design philosphy which meant VCR operation could be quite different from ways of Japanese videos on the market at the same time. One of the positive points was the inclusion of a key-pad on the front panel which allowed direct entry of time and date during clock/timer setting. An oddity was the omission of a timer-record switch. There was no need for one as the VCR would simply go into timer record at the appropiate time if it was left with an appropiate tape in it. Another nice use of the key-pad was a goto function which allowed quick access to any part of the cassette. The VCR featured picture search and reveiw modes were new for its time but did not a picture still mode. This model was also marketed in the UK under the PYE brand name.